Tarot is a visual language, and one where meanings can change depending on context and interpretation. While most decks follow the same basic format and meanings that go back, at least to the Rider Waite deck, there are some subtle and not so subtle differences. How a card is “read” is not only based on the knowledge of the reader, but on his or her ability to tune in — regardless of what one believes tuning in entails (supernatural or intuitive or simply skilled cold reading). Some cards tend to always look like bad news. 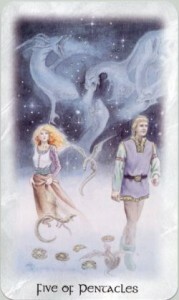 The Death Card in particular has a reputation that precedes it. I’m always at the ready to announce, “It’s not necessarily literal,” although clearly, necessarily isn’t much comfort to a worried querent. 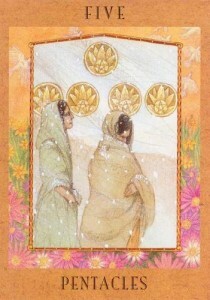 Another card which I tend to interpret as not-necessarily- bad-news is the five of pentacles. 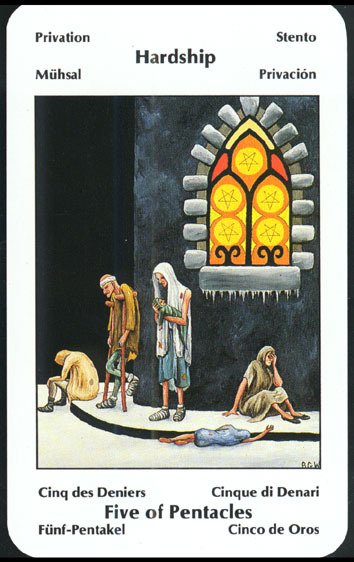 In the classic Rider-Waite deck, there are two destitute looking figures, one barefoot the other with crutches. 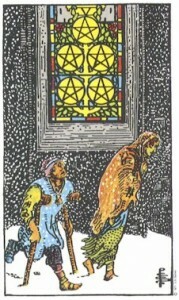 It’s a snowy night and they are walking past what looks like a church window with stained glass pentacles. The elements from this image are is more or less copied in many other decks. Such as here, in The Goddess Tarot. “Traditional” interpretations include hard times, rejection, not getting sustenance (in whatever form), ill health, weariness, etc. In some decks, the image brings to mind more one thing than another. 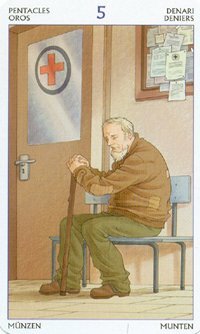 The Barbara Walker deck calls the image, “Hardship.” In 78 Doors a man is waiting for medical help. Celtic Dragon seems to take “rejection” literally. Here we see a man walking away from a woman. Spiral uses the “traditional” imagery, but with a twist. We see inside the Church window, contrasting the image of warmth and plenty with one of coldness and destitution. It reminds me of the old film, Stella Dallas, in which the crude waitress gives her daughter to her wealthy ex-husband so that she can be raised with all the advantages. At the end, Stella watches from outside as her daughter gets married. Here, the figures outside appear to be mother and child. Could the woman have been a rejected ex-lover of the happy groom? Yet, in this image only three of the pentacles are inside the church. The other two remain outside. So we might wonder, what is the meaning of the pentacles? Are they more than mere coins? Might they represent something bigger and even more valuable, that remains with us, even when we leave material wealth behind? This is supported in the deck I usually use, the Mythic Tarot. Note that the figure is leaving under cover of darkness. Here, he is alone, cloaked, almost hidden. In some ways the image is very like that of the seven of swords, a thief in the night. 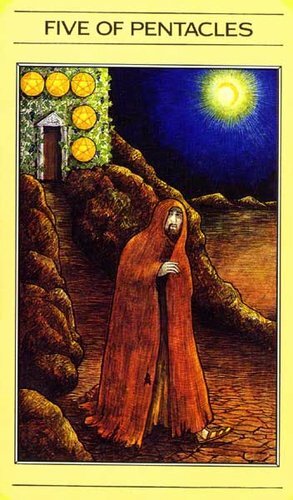 He is leaving behind a house which looks strong enough from the outside and has five pentacles on it. He doesn’t seem to be taking anything with him. He is not weighed down by his burdens. While his cloak is ragged, his sandals appear to be sturdy enough. If this is a card about rejection, here the figure leaving appears to be the one doing the rejecting, leaving something behind, but taking with him, what? His talents? His integrity? Leaving what you have with no certain prospect of getting anything better is a risky proposition, but it may be the best choice. Leaving a job that has become oppressive, breaking off a relationship that has feels like a jail, rejecting an offer that comes with too many strings — these are not easy things to do. Yet, if we stay where we are, we may lose who we are. If we leave with our integrity in tact, we remain on a path to being our best selves. Sometimes, you just need to walk away. 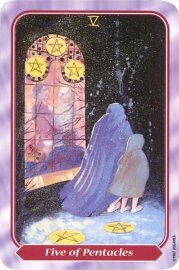 This entry was posted in Free Tarot Advice, self help, Tarot and tagged Five of pentacles, skeptical tarot, tarot, tarot intepretation, tarot skeptic. Bookmark the permalink.